The Luxury Giselle hoops are perfectly lined with breathtaking round cut Swarovski crystal stones along a 18k white gold plated channel set hoop design. SHOP WITH CONFIDENCE - Cate and Chloe is a leader in quality designer jewelry. Shop our entire collection which includes necklaces, earrings, rings, bracelets, and other fine jewelry and accessories. We strive to provide the highest level of quality, craftsmanship, and timeless designs that you can flaunt from the office to the red carpet. CHANNEL SET HOOPS FOR WOMEN - These earrings are the perfect fashion accessory for any woman! These gorgeous silver hoop earrings will flatter anyone, with the beautiful crystals on these earrings it will be hard for people not to notice! Soak in the compliments while wearing these earrings that features amazing swarovski crystals, and beautiful gold plating. No one will ever know that these earrings are costume jewelry, and you will know you look fabulous without going broke! GIFTS FOR MOM, MOTHERS DAY - These Crystal Hoop Earrings made with Swarovski Crystals will make the prefect gift for any woman! Need something special to surprise her? Need to get something for Mom on Mothers Day? What about that "push" present for your pregnant wife? These earrings are the perfect gift! Watch her eyes sparkle as she opens the box to see these beautiful earrings with clear crystal stones! Your lady won't be able to contain her excitement. 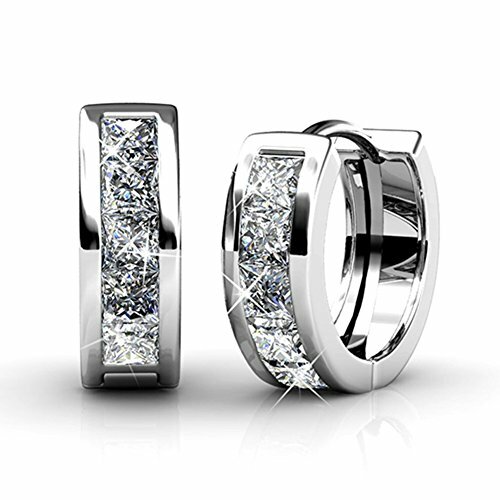 WHITE GOLD HOOP EARRINGS FOR WOMEN - Are you hoping to impress the girl you have been dating a while with new jewelry? These hoop earrings will be the perfect addition to any jewelry collection with its gold plating and beautiful crystals! This amazing earring can easily be worn with a gorgeous dress for a night out on the town, or with a pair of jeans and a nice jacket for a day date in the park. Give her these stunning earrings and whenever she wears them you know she is thinking of you!